(On the series's 30th anniversary, and DQ11) "I don't have much to tell now, but we're making many preparations. 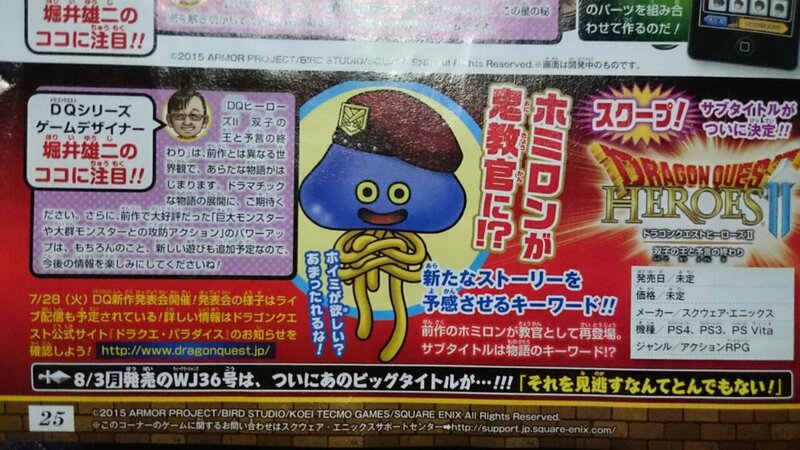 One thing is for certain, Dragon Quest 11 will be an offline game"
(About action combat like Dragon Quest Heroes) "No, Dragon Quest 11 will return to the roots of Dragon Quest. Another action RPG would be like Heroes, and we want to distinguish between the two." (On the possibility of a large-scale remake a la FF7 of older titles such as DQ3) "There are no plans at the moment, but there's possibilities in the future." (On Dragon Quest for smartphones) "I think games should be designed for the platforms they're on. Dragon Quest 11 is designed for home consoles." (On virtual reality) "I had the chance to experience Morpheus, and if I get the opportunity, I'd like to make something with that sort of technology."